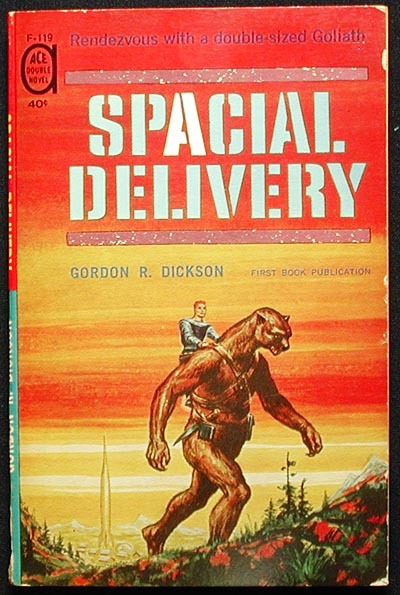 This “novel” collects Dickson’s three light space-opera adventures about humans, the bearlike Dilbians, and the jovial-but-sinister Hemnoids: Spacial Delivery, first published as a novel by Ace Books, November 1961, 123 pgs. 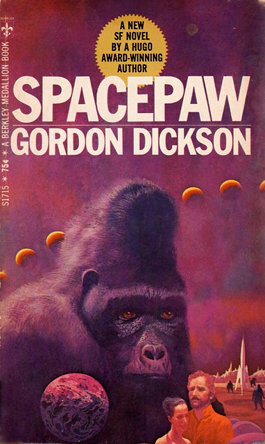 ; Spacepaw, first published as a novel by G. P. Putnam’s Sons, February 1969, 222 pgs. ; and “The Law-Twister Shorty”, a novelette in The Many Worlds of Science Fiction, edited by Ben Bova (E. P. Dutton, November 1971, pp. 51-105). These three adventures betray their Cold War time-period. The Humans (Americans) and the totalitarian Hemnoids (Soviets) are both expanding through the galaxy, trying to win over the unaligned planets like Dilbia to their spheres of influence. Compared to the Dilbians and the Hemnoids, the humans look like puny weaklings. Also, humans smell bad to Dilbians. The Dilbians’ attitude to the humans is one of friendly but condescending superiority. The Dilbians also have a fondness for mildly insulting humorous names for themselves and for anyone else who comes to Dilbia, such as Daddy Shaking Knees, Two Answers, and Split Nose. The Hemnoid ambassador is dubbed the Beer-Guts Bouncer, a name of approval to the beer-loving Dilbians. Humans on Dilbia usually don’t like the names they are given. In Spacial Delivery (expanded from “The Man in the Mailbag”, Galaxy, April 1959), young John Tardy, who expects to become an interstellar expert in biochemistry, is diverted to Dilbia instead. A human woman, Greasy Face (she wears a lot of makeup) has been kidnapped as a pawn in an affair of honor by the Streamside Terror, the leading brawler of the Dilbian hillbilly community of Clan Hollows. 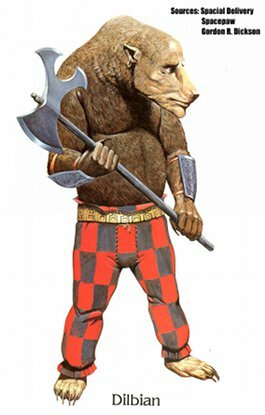 Tardy was an Olympic decathlon champion while he was in college, and Earth’s Alien Relations Office figures that he has the best chance of rescuing Greasy Face (Miss Ty Lamorc, a sociologist studying the Dilbians) if it comes down to a physical fight with the nine-foot bear. 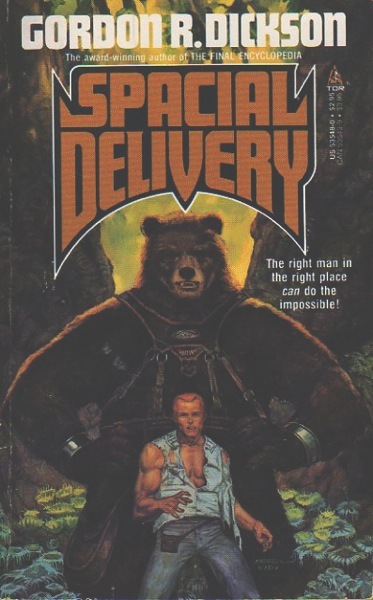 To get Tardy to the remote community where she is held, the Human Embassy decides to mail him: to have the local Dilbian postman carry him in his mailsack. A special saddle-like harness is rigged for Tardy to ride on Hill Bluffer’s back, which neither of them like but is better than riding in a mailbag. During their trek across the countryside through one small Dilbian hamlet after another, Tardy (dubbed the Half-Pint Posted) and Hill Bluffer become Odd-Fellow friends. Tardy, assigned to win the Dilbians’ support for the Humans, comes to respect their independence, their stiff sense of honor, and their casual contempt for formality and bureaucracy. He also gradually learns that there is more to the Streamside Terror’s kidnapping of Greasy Face than the official story. He has near-fatal accidents; he discovers that the Streamside Terror’s girl friend, Boy Is She Built, is following and trying to sabotage them to protect her lover; that a Hemnoid agent, Tark-ay, is helping her for his own reasons; and more. By the time he and Hill Bluffer catch up to the Streamside Terror, Tardy has iron-clad reasons both to fight and to avoid fighting, as well as the seemingly impossible dilemma of how a six-foot human can defeat a nine-foot clawed Dilbian experienced battler. Tardy takes advantage of the fact that Dilbians respect intelligence and cunning even over physical strength, and the Hemnoids are thwarted. 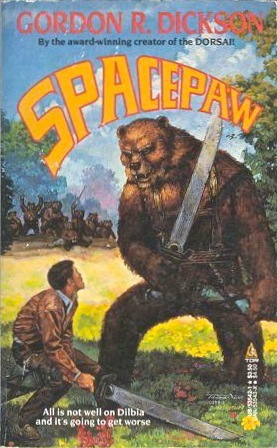 Bill Waltham, the protagonist of Spacepaw, is introduced similarly to John Tardy. He has studied to become a terraforming engineer – “He thought again of the great symphony of engineering and development that was a terraforming project – changing the surface and weather of a whole world to make it humanly habitable” (p. 142) – and he is disappointed to be drafted instead into the Agricultural Assistance Program’s Project Spacepaw as a sort of interstellar Peace Corps instructor to Dilbian farmers. This is a spade. You hold it by this end. You stick the other end in the earth. Yes, deep in the earth. Then you tilt it, like this. Etc. Waltham can imagine himself wasting the next two years among the giant bearlike peasants of the village of Muddy Nose. But his life on Dilbia turns out to be much more of a whirlwind than that. He arrives in Muddy Nose to find it full of wild-whooping outlaws who plan to hold him for ransom. He is saved by the Hill Bluffer, who names him Pick-and-Shovel and expects him to duplicate the Half-Pint Posted’s feat by rescuing another Human female captive, Dirty Teeth (Anita Lyme, the Humans’ Agricultural Resident’s trainee assistant), from Outlaw Valley. Hill Bluffer is not alone. Dirty Teeth has been kidnapped by the outlaws because she is a rabble-rousing Women’s Libber who has been stirring up the women-folk of the Dilbians’ patriarchical society, and those women, led by the militant Sweet Thing, expect Pick-and-Shovel to liberate her from outlaw chief Bone Breaker immediately. Spacepaw is basically Spacial Delivery all over again and longer. But the details are considerably different (plus the added exasperation of Pick-and-Shovel’s having to live up to the exaggerated reputation of the Half-Pint Posted), and they are colorfully humorous enough that you will not mind reading the story twice. “The Law-Twister Shorty” is Malcolm O’Keefe, a bewildered high-school student inexplicably drafted to quietly “rescue” three human tourists that an imperious young Dilbian, Gentle Maiden, has decided to “adopt” and, essentially, keep as pets in her community of Clan Water Gap. Both the Humans and Hemnoids have a strict noninterference treaty with the Dilbians at this time, except for rigidly-supervised exceptions such as this tourist party; and if the Hemnoids can prove the presence of humans in Water Gap after the tourist group has left, even as unwilling prisoners, they can gleefully accuse the Humans galactically as treaty-breakers. O’Keefe’s (or Law-Twister’s; he’s a school debating champion) assignment is complicated by the fact that Gentle Maiden’s boyfriend and protector is Iron Bender, Water Gap’s strongest young male, who is honor-bound to defend her actions. Neither Law-Twister nor Iron Bender are keen to be forced into a “let’s you and him fight” situation, so with the canny suggestions of Hill Bluffer and Water Gap’s elders who want to avoid a public incident, they find a way to defuse the crisis. The book’s jokey title and Richard Martin’s cover are very amusing, but they totally misrepresent the Dilbians as to the amount of clothes they wear, and to their preference for “verbal fencing” which favors outwitting an adversary rather than fighting. See the “imitation Ed Emshwiller” (not by Emsh?) 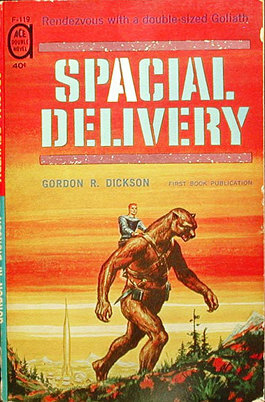 anonymous cover of Ace Books’ Spacial Delivery for a more accurate depiction. 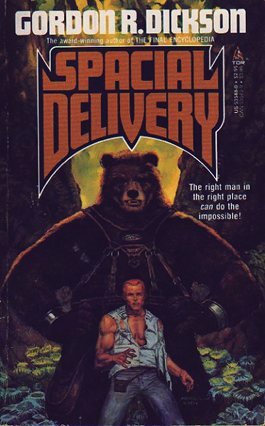 In fact, while I usually show only the first-edition covers in my reviews, here is a gallery of the previous editions of Spacial Delivery and Spacepaw. 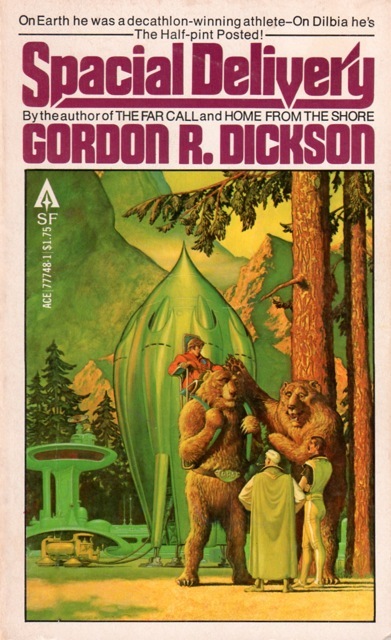 Note how the artist of the “imitation Ed Emshwiller” cover, Stephen Hickman, and Tom Kidd have tried to illustrate the Dilbians accurately (although usually still depicting them as giant bears rather than “bearlike”); while Leon Gregori and Paul Lehr have not bothered -- Lehr(?) even depicting the Dilbians as gorillas! Wayne Barlowe, in his 1979 Barlowe’s Guide to Extraterrestrials, has done the best job of drawing them as they are supposed to look. First, ignore the title and the cover art, however clever and amusing they may be. None of the three stories in this volume has much to do with providing weapons to the ursinoid Dilbians, whose culture shuns the use of weapons (for that matter, they're not so hot with tools either). 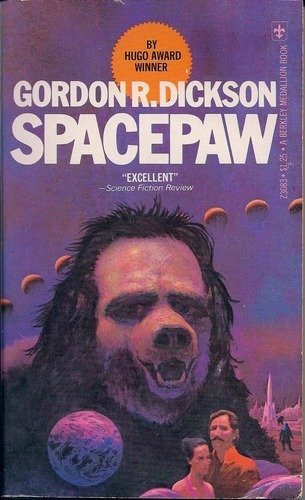 Second, fans of Dickson should be advised this book is an omnibus edition of three previously released works, "Spacial Delivery", "Spacepaw", and "The Law-Twister Shorty". I found these stories to be rather entertaining as something of a guilty pleasure, but overall I wasn't terribly impressed with the storytelling or the world-building. The Dilbians were amusing in their backward-thinking, but at times they tended to be a bit too, how should I say it?, "folksey". The manner in which the human characters were identified and thrust into the situations in these stories was too counterintuitive and far-fetched to be believable; nevertheless it did provide for some interesting problems for the human characters to puzzle over as they interacted with the Dilbians. Overall, not a great read but not too bad either. 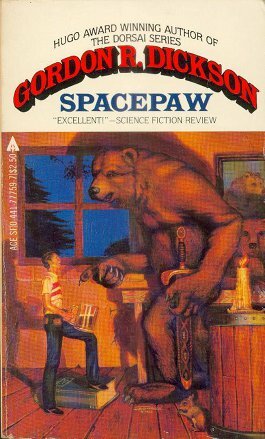 I might give it a more favorable review if I were to reread it now, especially since I seem to have been rather pedantic at the time about scientific plausibility of the setting, where now I could just let go and rate it based on whether the stories are entertaining. Your discussion of the cover art reminds me of something Lisanne Norman said about the covers of her books. She had complained that the covers of the first several books, all by Romas Kukalis, portrayed the Sholans as looking too much like earth felines and not alien enough. Then her publisher got Jim Burns to do one of the covers, and Norman was much more impressed with his portrayal of the Sholans, so much so that when they once again had Kukalis do the cover for a subsequent volume, he incorporated elements of Burns's version of Sholans into the artwork. I generally like Romas Kukalis' covers, but I am in awe of Jim Burns' art. There was an exhibit of several of his full-sized cover paintings at the 1995 Worldcon in Glasgow that was marvelous. I enjoyed the first two or three of Lisanne Norman's books, but they are not really separate novels. They are one continuing story, with the installments so far (years) apart that most readers will have forgotten what happened before by the time a new book is published. And there are no synopses; she dives right into the action. 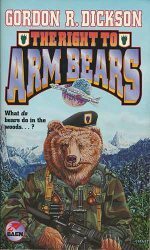 Al Jaffee of MAD magazine drew the "Right to Arm Bears" pun years ago. 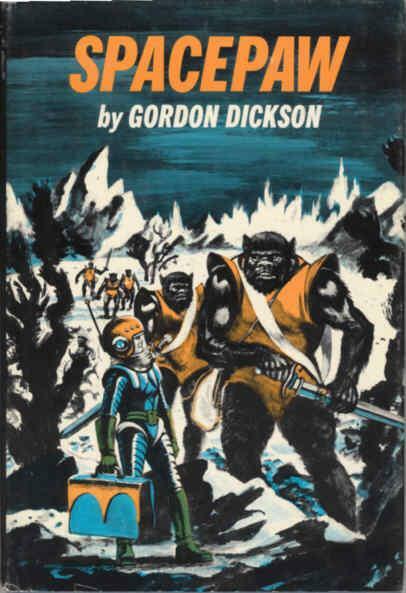 I suspect that its use for the book's title shows that Dickson was telling readers that these were not dramatic melodramas. 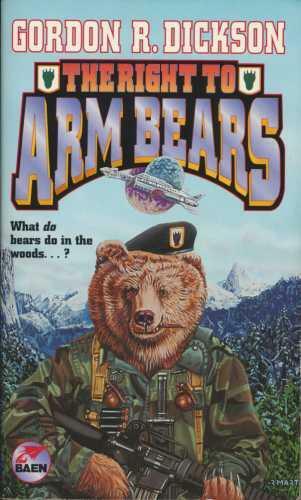 The stories may have been written during the Cold War, but by 2000 they were just an amusing relic of the past. Still fun to read, though. Frankly I'm skeptical whether Dickson approved of the title or the cover art. Because this was published on December 1, 2000 and Dickson died on January 31, 2001? Could be, could be ... Dickson was reportedly in very bad health and unable to leave his house during the month before his death, so he may have left the details of his Dilbian collection to Baen Books to finalize.